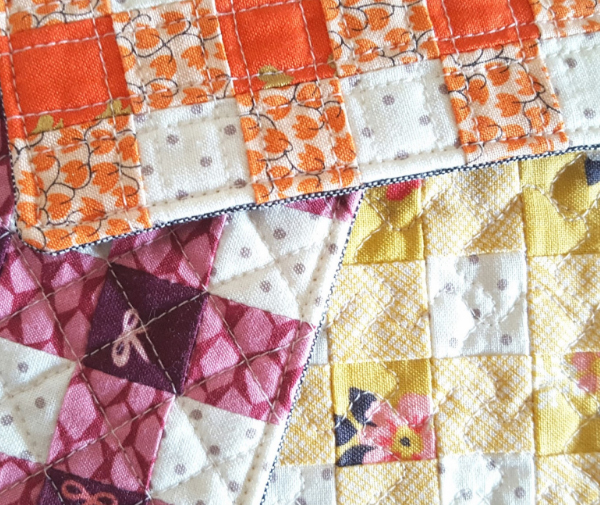 Fat Quarter Shop's Jolly Jabber: Pattern Makeover KICK-OFF! Are you looking for ways to put a sassy, new spin on some timeless patterns? Do you have some books just collecting dust on your shelf? Well it's time to give them a second life! 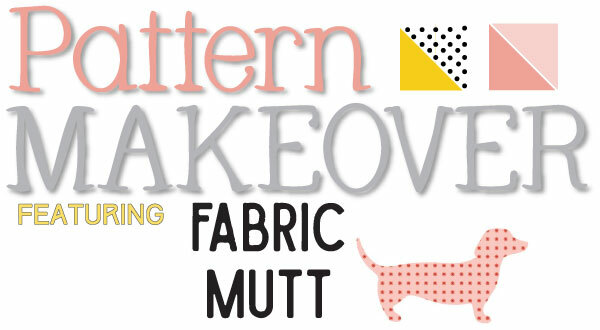 We've teamed up with Heidi from Fabric Mutt to bring you a sequel to the It's Sew Illustrated series! Over the next few months, we'll be giving our favorite It's Sew Emma books a makeover! 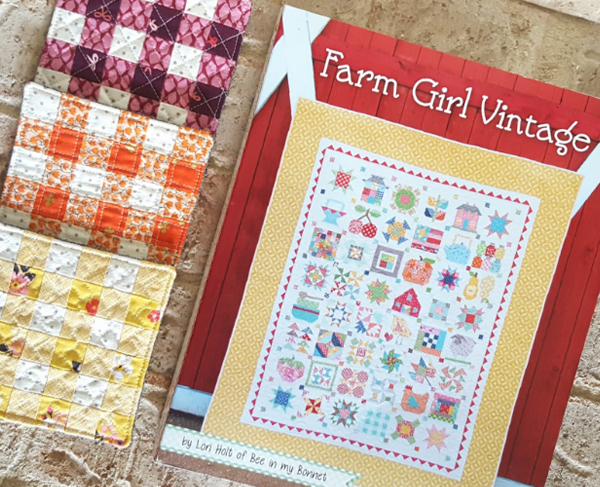 We're kicking off the Pattern Makeover series with a book that we all know and love - Farm Girl Vintage! Read on for project details from Heidi! My husband has been begging me to make coasters for our family room for months. 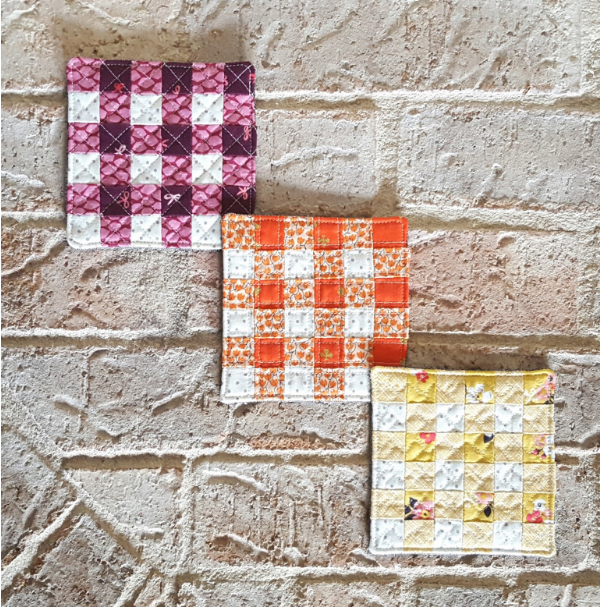 I’ve been wanting to tackle Lori Holt’s fantastic Gingham Block from her beautiful book Farm Girl Vintage ever since I bought it ages ago. Then my friends at Fat Quarter Shop asked me to do a new series for them by putting my own spin on patterns from a few of their It’s Sew Emma books. The result? 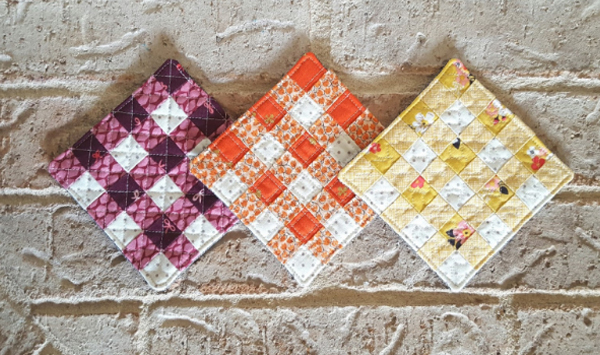 These fun little pieced gingham coasters. I downsized the pieces for a 6” block by just a quarter inch, using a strip piecing method instead of cutting out all the squares individually. It came together so quickly! Each coaster is quilted differently just for fun. All three are backed in black yarn dyed linen, giving them a sturdy backing that’s also a nice contrast to the colorful prints on the front. I love how this pattern is both traditional and modern at the same time. It’s also great practice for working with color values. I was sorely tempted to enlarge this block into a giant block to make a cute baby quilt. I’ll have to keep that in mind the next time I need a quick shower gift. Are you ready to select some fabric to make your coasters? Check out some brand new collections that we've picked for you! Wonderland by Rifle Paper Co. for Cotton + Steel features a variety of prints and colors! The hints of metallic would bring a fun highlight to your makeover coasters! Early Bird by Kate Spain for Moda Fabrics is bright and cheery and will add a punch of color to any room! With so many colorways, you could make coasters to match every room in your house! 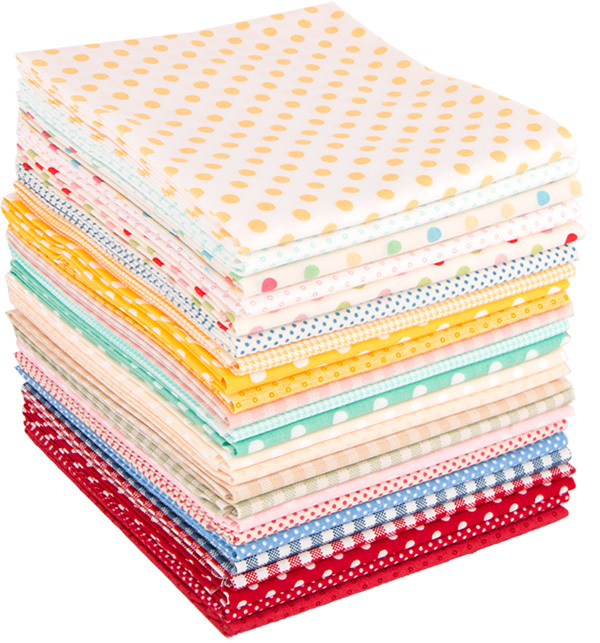 Dots & Gingham by Lecien Fabrics is a sassy alternative to traditional solids! With this collection, you wouldn't have to worry about perfectly cutting any prints! These are all small enough to work perfectly in Heidi's coaster project!